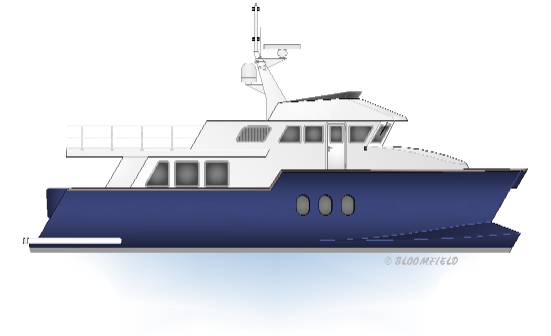 Bloomfield Catamaran Designs is developing a new range of Expedition Catamaran Motor Yachts with U.S. based company 'Pacific Expedition Yachts'. The new line of boats will suit owners who are looking for the toughness and reliability of a trawler with the comfort and classic styling of a motor yacht combined with all of the speed stability and room advantages of a catamaran. The great looks and cruising potential of these boats have already generated a lot of interest with both traditional monohull and seasoned multihull sailors who recognise the potential of the designs' many advantages over existing alternatives.